ComingSoon.net got a chance to sit down with Samuel L. Jackson who reprises his role as a younger Nick Fury when he makes first contact with a superpowered being in Captain Marvel. He talks about what it’s like to be able to go back to explore the iconic character’s past, collaborating with Brie Larson, seeing her thrive as the hero she truly is, and making Marvel films ten years later. Check out the full interview below! 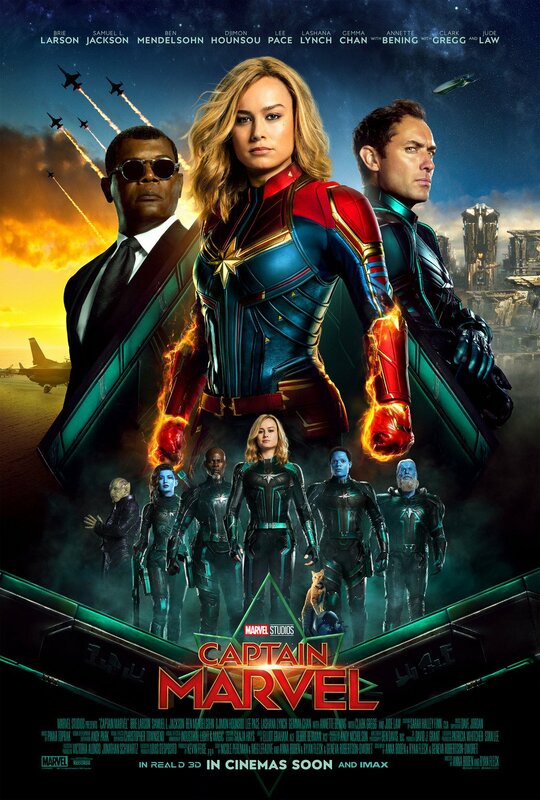 On March 8th, Marvel Studios‘ Captain Marvel takes us on a new adventure where a galactic war between two alien races collides on Earth and at the center of the fight a woman rises to become the universe’s most powerful hero. Brie Larson stars as Vers, a member of the Kree-race of space warriors who’s determined to find out her connection to Earth when she crashes on it with flashes of past memories. With the help of Nick Fury (Samuel L. Jackson) and Phil Coulson (Clark Gregg), Vers tracks down the only person who might be the key to figuring out who she truly is–Maria Rambeau (Lashana Lynch). Together they become something more and unite to fight battles they never thought they could. 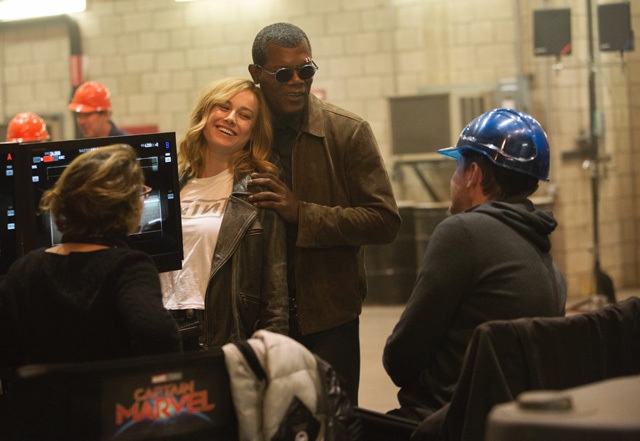 Marvel Studios’ Captain Marvel is produced by Kevin Feige and directed by Anna Boden & Ryan Fleck. Louis D’Esposito, Victoria Alonso, Jonathan Schwartz, Patricia Whitcher and Stan Lee are the executive producers. The story is by Nicole Perlman & Meg LeFauve and Anna Boden & Ryan Fleck & Geneva Robertson-Dworet, and the screenplay is by Anna Boden & Ryan Fleck & Geneva Robertson-Dworet. CS: You’ve been rooted in the fabric of the MCU since Marvel decided to base a version of Nick Fury in your likeness which wove you into these films. I want to know, what did you take away from your experience playing Fury that you were excited to explore the origins of in Captain Marvel? 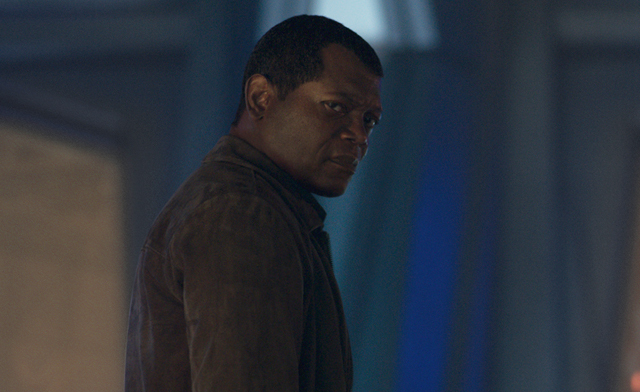 Samuel L. Jackson: It’s not really the origins. It’s kind of in the middle of what he is. 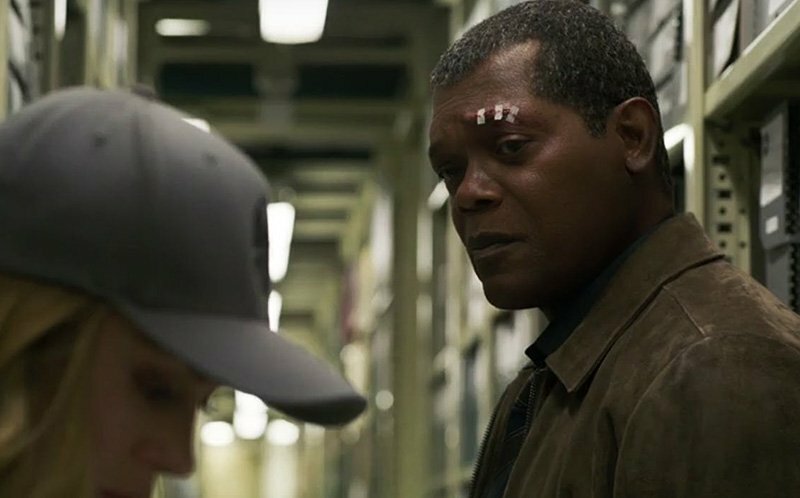 It’s the awakening of Nick Fury to the fact that the universe, the world is bigger than just where we live, the earth, that the universe does have an impact on us, and that there are beings from other places that come here. And who knows how long they’ve been coming here? So that’s the beginning of that for him, and understanding that maybe they have been keeping things away from him because that’s just the nature of how he thinks. And his relationship with this particular character grows through a sense of communal warrior-ism, in a way, as he tells her, I know a warrior when I see one. And their bond becomes cemented through that. And you know, when people go through things together, they tend to get closer, and that happens. So then, when she gives him that beeper and says, “Only in emergencies,” a lot of people go, well, there are a lot of times you could’ve used that beeper. Not really. You know, my idea of what an emergency is is way different from what the rest of the world would perceive as an emergency. I thought I had the people that could handle what we needed, until that very moment, where I had to use that. CS: That moment when you started to turn to dust in Avengers: Infinity War. Jackson: Yeah, this is an emergency. CS: Would you say there’s stuff about Nick Fury that surprised you or is he still someone that as they create him, you have a good say in how you want his story to unfold? Jackson: I don’t, really. I look at the situations that they present me with, and I deal with them accordingly in terms of what his attitude or what his understanding of those particular situations are and how he interprets them. It never occurred to me, and people think about you know, does he have kids? Is he married? Has he ever been married? All of a sudden it’s like, oh my god, Nick Fury has this human thing about him, that you know, is so uncharacteristic, yeah, like you wouldn’t expect him to take the time out of his day to play with a cat or to just be, just immediately see a cat and be like, “Oh my God!” Like that’s just not Nick Fury. 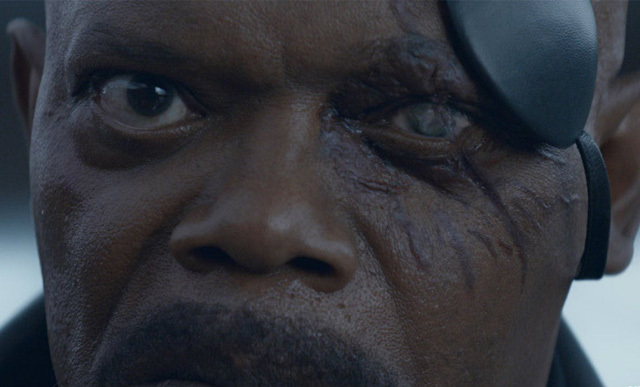 But all of a sudden, it is Nick Fury. CS: Did you always know that [redacted] was how Nick was going to end up with one eye? Jackson: I did not. You know, there were all kinds of theories, you know, war injuries, it was this, you know, a virus, or– there was all kinds of stuff. But I mean, there was even another version of the script, where there were a lot of things happening, and when that event did happen, there were things that people had, various things that he kept getting offered to use that would fix it, and he kept saying, “No, that’s okay. It’ll be fine. CS: After Captain Marel, we’ll be seeing you in Brie Larson’s debut as a director, which I’m very excited about. So I want to know, as an MCU mentor and a collaborator, what are you excited for the world to learn about Brie? Jackson: Well, I would assume by now they understand that she’s a multi-faceted actress, that you know, she did a very dramatic turn in “Room” and then she did her funny turn with Amy Schumer playing her sister and she did a little bit of adventure stuff in “Kong”. But this was a total emersion and a commitment that’s kind of beyond things that people understand in what happens when you accept a job like this. It starts to take a toll on you, and another thing, she started working out. She would send me the workout videos. And I know that through doing all of that stuff, you become a more confident and informed actor in terms of being a superhero, because a lot of times, when you read something on a page and say, okay, you have to do this, you have to figure out, okay, how much of it do I have to do and how much is the stunt person going to do? And in this particular universe, they kind of want you to do a lot of stuff. And as she got stronger and started to enjoy the physical aspect of what she was learning to do and going to have to do, it adds a different kind of confidence to you, when you’re the character and you’re studying it, you assess people in a different way because you know that there are certain things that you can do that they can’t or you realize that, okay, I’m faster and stronger than I used to be, and I don’t have to—it made me think about how to make this happen. I can just make it happen. But they’re going to find, an ultimately confident woman, that this character was proposed to be. And because she was this accomplished, smart, successful woman in a male-dominated world, who was able to do something not a lot of people can do, fly a jet, she already had all of these things before she became Captain Marvel. So the things that they think they gave her or they keep insisting to her, you are who we made you, once she realizes who she used to be, she knows that I’m a lot of those things without anything that you’ve ever given me, and this is probably something that I can enhance and make work myself, without whatever it is you think you’ve done to me. And she is able to do that because she knows that she’s able to accomplish things and that she is a special person. CS: That’s amazing. All right, so we’re a little over the 10-year mark of these films. I want to know, what do you think is different about making a Marvel movie now with Kevin Feige versus how it used to be when you guys started? Jackson: Well, the technology’s changed a lot. The Marvel playbook is way more refined than it used to be. The stories are becoming more intricate. There are moments of—this movie is a real game changer in an interesting sort of way because there are things that happen in this movie that don’t necessarily happen in other kinds of films. I mean, we have moments of drama and worry and all those other things. But in this particular film, you find the confidence of a failure and a recovery. You find a sensitive nature of camaraderie and friendship between two people that we haven’t normally had. Interestingly enough, you know, when you start talking about two characters that love each other, she and Ms. Rambo, her flying partner, who went through flight school together, their relationship is intimate, in a way. That when they have conversations, the rest of the movie kind of falls away and it’s not really, you know, you can lose the fact that, okay, she’s got superpowers and there’s stuff going on and there’s aliens and all of this. They have a really personal conversation that is about real human loss and pain and all those things that you know, we only see in serious movies. And when they have them, you accept it. And it’s part of the fabric that makes the film work, so that when that’s done and her daughter comes in and she’s there with them, you see that that’s a unit. CS: That’s a unit. It’s a family with Maria and Monica, yeah. Jackson: That works in a very real kind of way and that little girl means it, when she says to them, “You’re my role models. And you guys are extraordinary and because you’re extraordinary, I’m going to be extraordinary.” And it’s all this support for that gender, that we normally see as women at odds with each other. But here’s the thing that makes them even stronger, because they were together, flying together, they were flying higher, faster, further. They were the best of the best of who they were, even though there were men around, they were better than those guys. And they are strong women in their own rights without super powers. And they are reinforcing the generations coming behind them and making sure that they are being better people so that she could be a better person. And that’s something you see in, you know, superhero movies.